Today’s the first day of Daylight’s Savings, and Tom, in his typically astute fashion, points out that it should be a National Holiday. The rate of accidents increases when the times shift because people have messed up sleep schedules. It would be much safer to have an extra day on the weekend to adapt. Plus, in this case, it gives us more of a chance to celebrate the long evening hours. 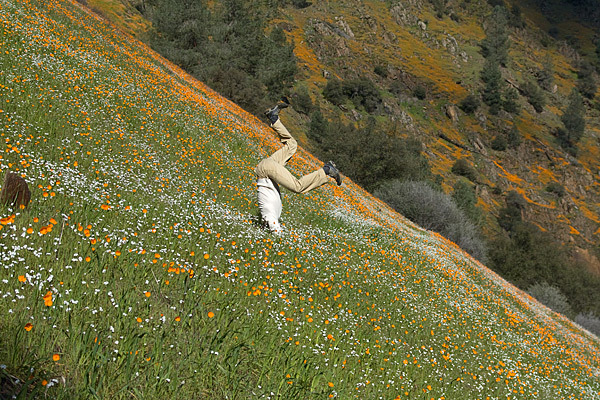 We piled a bunch of friends in to the car today and wandered down canyon to take pictures of the wildflowers. It was a gorgeously warm and sunny day, and the poppies, as everyone has been claiming, are out in force already this year. When we stopped at Hites Cove, we also saw huge clusters of blooming Popcorn flowers, Blue Dicks, Gold Fields, Shooting Stars, Baby Blue Eyes… and all the flowers that we don’t know or can’t remember. It’s an amazing display. The lupines aren’t out yet, and I always look forward to the Fairy Lanterns, so I suspect we’ll be taking more trips down there to watch the spring bloom. When we got back to Yosemite West, it was almost shocking to see the amount of snow that was still there. Being able to drive back and forth between seasons is like getting to travel through time. Turns out, Spring is only about 5 miles from Winter, as the crow flies. a la Facebook… Here are 25 things about me, in no particular order. It was harder to think up than I would have guessed.